Thank you to Click Communications for providing me with product, in exchange for my honest review. All thoughts shared are my own. This winter’s coolest family comedy, Norm of the North, slides onto Digital HD March 29 and Blu-ray Combo Pack (plus DVD and Digital HD) and DVD (plus Digital) April 19 from Lionsgate. Telling the ultimate tale of a loveable underdog who proves anything is possible with determination and a posse of loyal lemmings, Norm of the North features the voices of Rob Schneider (Grown Ups), Heather Graham (The Hangover franchise), Ken Jeong (The Hangover franchise), Colm Meaney (Con Air), Loretta Devine (TV’s “Grey’s Anatomy”), Gabriel Iglesias (Magic Mike), Michael McElhatton (HBO’s “Game of Thrones”) and Bill Nighy (Love Actually). B is super excited to check out Norm of the North! We were pretty excited to check out Norm of the North. We had previously seen the trailer, and thought that it looked relly cute and funny. B is a big fan of movies like The Penguins of Madagascar, and this movie seemed to be right up his alley, too. It's been a long winter for us, and spring feels like it just doesn't want to stick around, though we're ready for it to be here for good! Norm of the North was a great choice for a Friday family movie night. We love to make homemade pizzas on Fridays, and park in front of the TV to watch a family-friendly movie together. This movie has the Dove seal of approval on it, which means that it is suitable for families. I like not having to worry about what type of language or situations might be portrayed in a kids movie- these days, you just never know, and we're pretty strict when it comes to what B is able to watch. We relly enjoyed this movie- the setting was fun, the characters were oh, so lovable, and the story was great. With an overall message of why worry about trying to fit in when you can just be yourself, I thought it was a great message for my five-year-old to hear. The movie kept us entertained, and kept B engaged, which is hard to do! He has already asked if we could watch this one again, which is a clear sign that he really loved the movie. One of the best things about the combo pack, is that it includes a digital copy, which allows us to watch the movie right on any of our devices at home, like the Roku, tablet, computer, etc. Couldn't be easier for us to find it, click on it, and watch it! With a newborn at home, we're all about taking the easiest route possible these days. We love Norm of the North, and think you will, too! We definitely recommend checking it out and adding it to your family movie night list! 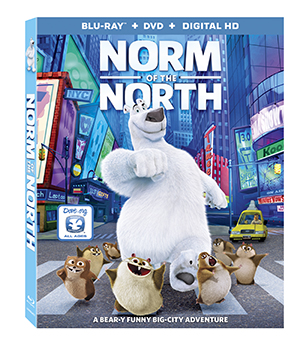 Look for Norm of the North wherever home entertainment discs are sold! For more Norm of the North fun, head to http://www.normofthenorth.com/ or connect on Facebook. This is just the type of movie I could watch with my youngest nephew. He's 6 & he's here most days. We both love funny movies!